The other week I went on a little trip that involved going across the border to grab some goodies that are not sold here in Canada. Target and Ulta were my top destinations (a hockey store 45 min from the border was his). 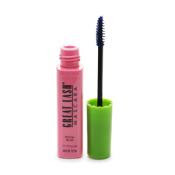 Maybelline Great Lash in BLUE - yep blue great lash. Despite the fact I don't wear blue mascara (I have blue eyes), I thought for the $5 it cost me I should grab it and have it for my kit. It dries a vibrant blue and has the same tried and true Great Lash formula that makes it the worlds best selling mascara. Since coloured mascaras usually cost a lot (or at least for a vibrant one) I felt I couldn't pass it up. The only con, no other colours, just blue. 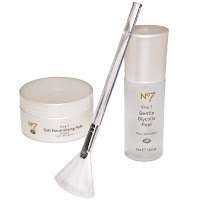 Boots No7 Glycolic Peel Kit - Although Shopper's Drug Mart sells the legendary Boots line in Canada, they do not sell everything that you can get in the USA or the UK made by Boots. We do not have their Mediterranean line or many of the No7 high end treatments. I have yet to try this baby out but I wanted to try something serious in the glycol department and the one step wipes made by Avon didn't seem to be the right fit for me. I like the fact that there are steps to the kit and it is made by such a reputable company. 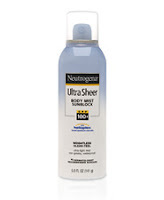 Neutrogena Ultra Sheer Body Mist Sunblock with Helioplex SPF 100 - Ok you are all going to call me nuts on this and the next one. I know you can get the regular body cream sunblock by Neutrogena in a 100 spf in Canada, but I like sprays for my sunblock. It is a fact that most people do not apply enough sunblock/sunscreen. We should be using a whole shot glasses worth on our bodies to get the protection listed on the label. I know I don't use that much, so I always fear that I'm going to get burned...and bad (like last year, I still have marks for 8 months ago). I must say I love the Sheer Body formula, it absorbs within minutes and leaves the skin feeling soft and non greasy. I wore this last Sunday to the Blue Jays game with the roof open and then drinks on the patio until sunset (that's over 9 hours of being in the sun) and I was the only one who didn't get burned or even tanned. I am so happy with this. Another reason why I grabbed it was the price, to buy the 60 spf version here costs over $15 to buy this was $8.99...big difference and it is stronger so it should last me longer. 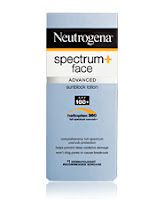 Neutrogena Spectrum+ Advanced Sunblock Face SPF 100+ - this falls in the same crazy category as the last item. You cant get this strong of a sunblock here, and the highest one cost about double the cost of what I paid in the USA. For the face we should all be using about a teaspoon. I know I don't use that much! Claiming that my face lotion has a 10 spf or a 25 spf means nothing to me, I know there isn't enough in there to protect my pale skin, also it is so low in spf I doubt it would do anything anyways. This stuff is thick but will not make you break out. The only flaw I have with it is the texture, I like smooth feeling products on my face. I like to mix it with a bit of CoverFx Skin Prep for a smoother feeling on my face. I don't want to get wrinkles, skin cancer, or anything else that sun exposure can cause, so I'm loving this product. 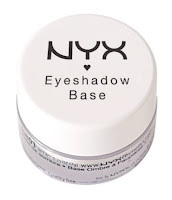 NYX EyeShadow Base in White - I went to Ulta and they had a buy 3 get 1 free NYX deal. I grabbed the last of their eyeshadow bases, it was white. I've tried it out a few times. It is supposed to make colours more vibrant by using a white base. It is ok. Not a great primer, actually I'm convinced it is that same as those gel liners you can get on eBay or Costal Scents. I compared mine to it, the feel and look the same. It was cheap so I will try it a few more times and see if I grow to like it more. NYX Jumbo Eye Pencil in HOT PINK - I grabbed this baby because I've yet to see it in Canada. When I got home I realized it is the exact same colour as Mac's Pro Magenta Madness Chromoline. 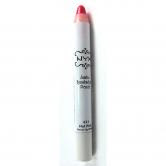 It is a smooth fat eye liner pencil that blends and smudges out easily. Like all the Jumbo Eye Pencils the make a great eye base if you use a good primer underneath and use it sparingly (or they crease like mad). Runway Palette in Secret World - I reviewed these last week, take a look!